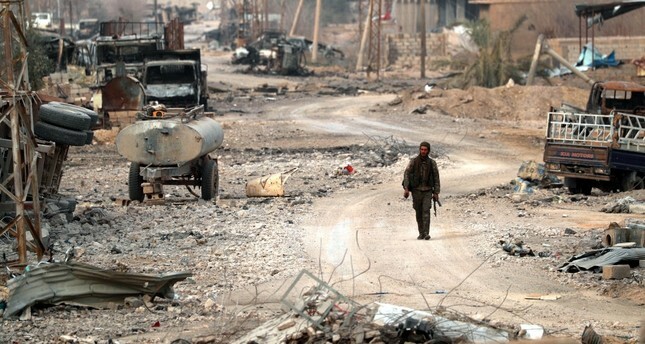 A member of a local radical group, who joined the YPG-dominated SDF forces, walks amid debris in the Syrian village of Baghouz, Jan. 27, 2019. On Jan. 18, The Washington Post published an article penned by Brett McGurk, the former U.S. special envoy for the Global Coalition to Defeat Daesh, entitled "Trump said he beat [Daesh]. Instead, he's giving it new life." McGurk tried to explain and warn readers against the U.S. president's decision to withdraw from Syria. McGurk went on to say it would be catastrophic considering several legitimate facts – though, according to observers in Syria, the statements in the article of the former U.S. envoy are fabricated and misleading to hide other goals and intentions such as tearing apart Syria and destabilizing neighboring countries. First, McGurk said U.S. President Donald Trump made this sudden decision after a call with President Recep Tayyip Erdoğan, who suggested that Turkey would eliminate the Daesh remnants in Syria. He also added that in fact, Turkey cannot intervene hundreds of miles from its borders in hostile territory without significant U.S. military support. Likewise, according to McGurk, Syrian opposition groups, supported by Turkey, have declared their intention to fight the PKK-linked terrorists rather than Daesh in the region. It should be clear to everybody that these groups described by McGurk as "radical" received U.S. support directly in the past and others indirectly through U.S. allies, with some of them present during international negotiations related to Syria. Additionally, McGurk accused opposition forces of fighting the "Kurds" and not Daesh. This statement is meant to mislead the public in general and the U.S. in particular, especially considering that their aim is clearly to fight terrorist organizations on the east and west banks of the Euphrates. The majority of opposition fighters from those areas – east of the Euphrates, where the majority of the population is Arabs – are on the front lines fighting the Syrian Democratic Forces (SDF), dominated by the People's Protection Units (YPG). This is the opposite of what the U.S. envoy claimed, that the region was against Turkey and Syrian opposition forces participating in the campaign against separatist and religious terrorism. McGurk and the officers in charge of this case haven't hidden their support for the PKK militias, who control anti-Kurdish areas, such as Manbij in the north of Syria, where the Arabs make up more than 94 percent of the total inhabitants. The inhabitants of the city are protesting and closing their shops in opposition of the Democratic Union Party (PYD) and demanding they leave the city. The same is happening in other areas, with conflicts between the Arab tribes and the PKK militias in eastern Syria. Citizens oppose the group's racist practices against Arabs, who constitute the majority in all areas occupied by the separatist militias, the Syrian extension of the PKK. PKK terrorists are constantly trying to change their names to avoid accusations of terrorism and the war crimes they commit. They have given themselves a democratic aspect, even if it's only a formality, to fool the media and international public opinion. They have also tried to include some Arab and Syrian members in their forces as cover. In that context, Talal Silo, a spokesman for the Syrian Democratic Forces (SDF), said the commander of the U.S. Army Gen. Raymond Thomas, the head of Special Operations Command, told the YPG to change its "brand" because Turkey views them as an extension of the PKK and they quickly changed their name to the Syrian Democratic Forces. Also, Silo said that there was an agreement between the United States and YPG leaders under the direction of Washington to support the PKK-affiliated militants with weapons and equipment. In order to not shock the public with the U.S. support of the PKK/YPG, they formed the SDF, pointing out that the weapons were sent to the SDF before its formation or naming. Silo added, "As everybody can see, the objective of the formation was just slogans, and they turned out to be false and unrealistic. They wanted to influence the citizens in those areas by suggesting that the goal of the Syrian Democratic Forces was to fight terrorism and bring justice and dignity to the citizens, but unfortunately all that happened was the destruction of cities and the displacement and killing of the population; even when they were placed within protected areas, these forces were extorting and killing the population and destroying their homes." Silo explained why Washington chose such a method, saying, "All ideas were put forward by Brett McGurk. During the liberation operations of Raqqa, he asked for the formation of a force in the name of the Arab Alliance, whose mission was only to receive weapons. Huge quantities were received indeed; Arabs and Turkmens and Assyrians have received small numbers of light weapons. The coalition bore the name of the Arabs but did not own anything, and the military council of Deir el-Zour has the only mission to sign on the reception of these weapons. The U.S. knew everything about this operation and did deliberately want this to happen, in order to hide the reality of the arrival of these weapons to the PKK, but we were confident that the sophisticated weapons were going to the PKK and YPG." McGurk added also in his Washington Post article that the deployment of Syrian opposition forces supported by Turkey will most likely lead to the displacement of thousands of "Kurds," as well as threaten the already weak Christian communities that live in the areas. He deliberately ignored the presence of about 5 million Syrians living in Turkey, including Arabs, Kurds, Christians and others; this group was not mentioned by McGurk but are, in fact, treated well in Turkey, with the right to education, healthcare and employment. Many of them have been granted Turkish citizenship, including Syrian Kurds, which contradicts McGurk's claims of displacement, while the United States prevents even sick Syrians citizens from entering its territory. Amnesty International stated in a report in 2015 that "a fact-finding mission to northern Syria has uncovered a wave of forced displacement and home demolitions amounting to war crimes carried out by the autonomous administration led by the PYD controlling the area." Amnesty's researchers "visited 14 towns and villages in al-Hasakah and Raqqa governorates in July and August 2015 to investigate the forced displacement of residents and the demolition of homes in areas under the control of the autonomous administration." Satellite images that the organization obtained illustrated "the scale of the demolitions in Husseiniya village, in the Tel Hamees countryside." The images also showed "Some 225 buildings standing in June 2014, but only 14 remaining in June 2015 – a shocking reduction of 93.8 percent."